Those quotes are real and so is this! I get emails or inbox messages from my former clients who are getting job offers and moving on to bigger and better things; all because they hired me to help them with their resume and cover letter. Any resume writer or career coach will tell you that the resume and cover letter are the starting points, you also have to have good interview skills, but if you do, then a great resume and cover letter will help you get that much closer to putting in your 2 weeks notice. They say about 70% of the current work force is unhappy and looking for a job or a new job. Don’t believe me, read this one from Vivian Giang on the Business Insider website. I’m glad that everyone is looking for work. I’m also glad to be writing resumes which help people get work. There’s nothing like hearing from a client when they have a new job. ESPECIALLY, when they can put in a 2 weeks notice to an employer that may have taken advantage of them, disrespected them, or not appreciated them. 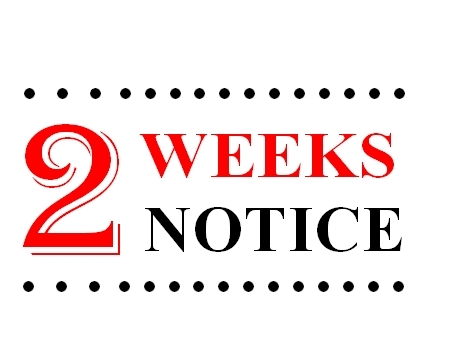 You see, as an HR professional with over 13 years in HR (est.1999) I’ve always been a fan of the 2 weeks notice. Did you know that unless you have a work contract that a 2 weeks notice is not required by law; it’s a courtesy. Yes, which means you don’t have to give your employer any notification if you don’t want to. It’s just the polite thing to do – you know that whole bridge burning thing. I like the process of the 2 weeks notice because in most cases – each time someone puts in a two weeks notice it’s because they have found something better. If companies treated their people better, they would probably see less of them. Sure sometimes people move on and there are no hard feelings but most of the time, they move on because they hate their pay, coworkers, bosses or job duties. The 2 weeks notice is not a sad thing – it’s a good thing – no, it’s a great thing. It means this person is about to explore a new endeavor. They are about to navigate new terrain. They are about to grow and test the market – taking on new challenges. They are not allowing themselves to be held to the status quo. They don’t subscribe to the “Happy to Have a Job Philosophy”. They are not allowing the golden handcuffs of tenure (benefits) to keep them from pursuing other interests. The 2 weeks notice is freedom – it’s a commencement – it’s a statement that I’m still aggressive and will not become complacent or entitled. It’s happiness. 2 weeks notices can be awesome and I’ve helped a few hundred people put their notices in and I’d like to help hundreds more. So what do you say? – let me help you put in your 2 weeks notice. this was very inspirational, i’m sure that’s not the case for each 2 week notice, but i really enjoyed reading it, Thanks! NB, you’re right, every situation is different. But seem many people can relate to the ones I’ve outlined here. Thanks for your comment and reading the article.